As many of you know, I’ve been incredibly busy with the launch of my book, Reconstructing the Shield of Achilles. To be honest, I had no idea that writing a book was the easy part, compared to the work involved with a book launch. In his latest historical novel, The Falcon of Sparta, Conn Iggulden masterfully brings the epic struggle of ancient Greek mercenary soldiers alive as they traverse the harrowing terrain and poisonous politics of the vast Persian Empire around 400 BCE. Carefully researched and clearly written, this exciting novel fleshes out Xenophon’s immortal travelogue, Anabasis, with cinematic scenes pumping with all the drama and passion of clashing warriors, opulent palace banquets, and diplomatic betrayals. Roughly twelve thousand mercenary soldiers gathered from all corners of the Greek world are led by the Spartan general Clearchus in support of the Persian Prince Cyrus. Secretly conspiring with his top generals to overthrow his brother, King Artaxerxes, Cyrus launches an ill-fated campaign that ultimately faces a Persian force of innumerable thousands at the Battle of Cunaxa. Even as Spartan red-cloaks set the same pace in the immortal footsteps of the 300 who held Thermopylae a generation earlier, the heroic Greeks ultimately face a similarly devastating change of fate when Cyrus falls in the course of battle. The following events are so dramatically and realistically described that they draw us in, not as mere readers, but as terrified camp followers struggling to surmount page after page of seemingly insurmountable challenges. As the New York Times bestselling author of the Emperor, Conqueror, and Wars of the Roses series, Conn Iggulden wields his pen like a finely-honed sword in the service of History’s Muse, captivating us once again in his latest heart-pumping epic, The Falcon of Sparta. Scheduled for launch on Amazon.com on 5 February 2019, I am one of the thankful folks who received an advance review copy of The Falcon of Sparta from Pegasus Books on NetGalley. I love this book and wholeheartedly recommend it to all lovers of superb historical fiction, especially fans of Ancient Greece, heroic Spartans, vicious Persian court rivalries, and blood-curdling military campaigns. 5 stars are just not enough! 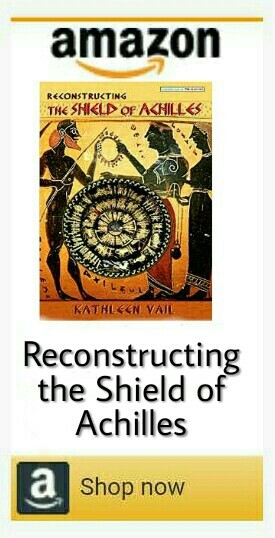 ← My Book, Reconstructing the Shield of Achilles, is Now Published! Congratulations! Sounds like you are having an exciting adventure. Happy New Year! Thanks so much, Rebecca! Yes, it’s quite an adventure – Happy New Year to you too! WOW !! This book sounds just up my street Kathleen. I love anything to do with the Greek military sector. As a matter of fact I am trying to make up my mind whether to choose the Military sector or Pottery for my last thesis of my Linear B Study. The military is more exciting but I know more about Pottery. Glad to see you enjoyed this so much. I really love to see historical novels done well! Thanks, your review is wonderful, too! this is wonderful!! All the best for this new year Kathleen!